Tertiary Minerals plc is pleased to advise that it has staked claim to the Paymaster zinc-copper-silver-Cobalt-Tellurium prospect in Nevada, USA. The Company is also pleased to advise that the next phase of Scoping Study level metallurgical testwork is due to start by the end of February for the MB fluorspar project in Nevada. Commenting today, Managing Director, Richard Clemmey said: “Whilst we continue with our strategy of reviewing project acquisition opportunities potentially capable of generating revenue and profits in a shorter timescale, we have also expanded our scope to include earlier stage projects which can be developed organically”. “We are therefore pleased to have secured the first project in the pipeline of exciting new projects currently being assessed. As well as progressing our MB fluorspar project, building a new project portfolio should enable the company to reduce its future geographical, technical, permitting and commodity risk exposure and provide long term shareholder value”. Zinc skarns1 are important not only as a source of zinc, lead, copper, silver and other associated metals but also as indicators of buried porphyry copper and molybdenum deposits. As a class of mineral deposit they include a number of world class zinc-silver deposits such as Antamina in Peru. The Paymaster skarn mineralisation was originally prospected in the late 1950’s under US Defense Minerals Exploration Administration grant system. 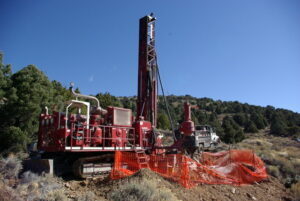 A government mining engineer recommended that the project be drill tested, but records suggest this did not take place and no production ensued. In 1960 it was the subject of a brief publication by the US Geological Survey when zinc rich secondary clay minerals, sphalerite (zinc sulphide), galena (lead sulphide) and magnetite were identified in a pyroxene-garnet-quartz skarn mineral assemblage at the eastern end of the area now claimed by the Company. The prospector scale workings were later described in a Geological Survey of Nevada publication in 1991 by an acknowledged world expert on skarn deposits, Lawrence (Larry) Meinert who, on the basis of his observations, concluded that the Paymaster skarn must be part of a much larger hydrothermal system. Within the Company’s claim holdings, the skarn mineralisation has recently been traced westward over a total distance of 1.7km in a number of wide spaced and very shallow prospector pits. Seven grab2 samples of the skarn mineralisation exposed in or excavated from the pits average 10.1% zinc (maximum 20.9%), 1.5% lead (max. 6.5%) 134g/t silver (max 253 g/t or 7.3 ounces/ton) and 0.68% copper (maximum 3.4%). The skarn samples also contain up to 0.11% cobalt (average of 419ppm or 0.045%) and up to 58ppm tellurium (average 31ppm) and 782ppm bismuth (average 315ppm). Cobalt is in strong demand for use in new generation batteries. Tellurium’s primary use is for manufacturing films for photovoltaic solar cells. When alloyed with other elements, such as cadmium, tellurium forms a compound that exhibits enhanced electrical conductivity. Therefore, a thin film can efficiently absorb sunlight and convert it into electricity. The mineralised skarn samples were collected largely from one stratigraphic horizon within Cambrian age limestone in contact with shale close to a shale contact and 1 mile south of the limestone contact with the Cretaceous age Lone Mountain granite pluton. Where sampled the skarn appears to be associated with cross cutting faults and the continuity along strike between exposures is currently unknown but pinch and swell is seen on a local scale. The Company intends to carry out follow up exploration on the Paymaster skarn to identify suitable drilling targets. Grab samples are often taken during the initial stages of a mineral prospect evaluation and cannot be consider representative of the mineralisation as a whole. The information in this release has been compiled and reviewed by Mr. Patrick Cheetham (MIMMM, MAusIMM) who is a qualified person for the purposes of the AIM Note for Mining and Oil & Gas Companies. Mr. Cheetham is a Member of the Institute of Materials, Minerals & Mining and also a member of the Australasian Institute of Mining & Metallurgy. Cadence Minerals (KDNC) Auroch Minerals (ASX: AOU) Reports High Grade Copper Results From Arden Base-Metals Project. Cadence Minerals (AIM/NEX: KDNC; OTC: KDNCY) is pleased to note the update published today by Auroch Minerals (ASX:AOU) ‘Auroch’ regarding reconnaissance sampling at its Arden Base-Metal Project ‘Arden Project’ located in South Australia’s under-explored Adelaide Geosyncline. Auroch reports that thirteen of the thirty-six rock-chip samples taken from gossanous material near the historic artisanal Mount Arden Copper Mine returned results over 2% copper, including several high-grade results of 20.40%, 15.25%, 8.55% and 5.52% copper. 20.40%, 15.25%, 8.55% and 5.52% copper (Cu). The sample results define an area of anomalous to high-grade copper at least 1km-long. 12.80m @ 4.96% zinc (Zn) from 53.00m, including 3.65m @ 15.47% Zn from 62.15m. The encouraging results will be followed up with geological mapping and more systematic sampling in the coming months, working towards the next phase of drilling proposed for Q2. The Company continues to collate and interpret all existing data for its Torrens East Copper Project. 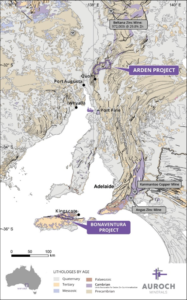 Located some 335km north of Adelaide, the Arden Project boasts a large relatively unexplored exploration area of 1,664km2 and is highly prospective for sedimentary-exhalative (SEDEX) mineralisation. Within the Arden Project, up to three horizons of SEDEX zinc mineralisation were identified from the recent drilling programme at the Ragless Range Prospect extending over 3km of strike and open in every direction. The sampling programme is focussed on gossanous areas in close proximity to interpreted major geological structures which coincided with the same stratigraphic horizons observed to host the zinc mineralisation at the nearby Ragless Range Prospect. This strategy followed up on the results from drill-hole RRDD007 completed by Auroch last year, which was drilled under an ironstone gossan coincident with where an interpreted fault structure intersected the stratigraphy hosting the SEDEX zinc mineralisation, resulting in significant high-grade zinc intercepts. The sample results announced by Auroch today define an area of anomalous to high-grade copper at least 1km-long by 300m wide. Numerous ironstones and gossans outcrop within the mineralised area. The orientation of the ironstones is conformable to bedding and suggests they are stratabound. The host rocks consist of ferruginised carbonates similar to those observed at the Ragless Range Prospect. Cadence Minerals (AIM/NEX: KDNC; OTC: KDNCY) is pleased to note the update published today by Auroch Minerals (ASX:AOU) ‘Auroch’ that it has applied for a large exploration tenement package in the Lake Torrens region of South Australia. Auroch’s Torrens East Copper Project comprises two exploration licence applications (ELAs) covering a combined area of 1,622km2 and is considered highly-prospective for IOCG (iron oxide – copper – gold) mineralisation. 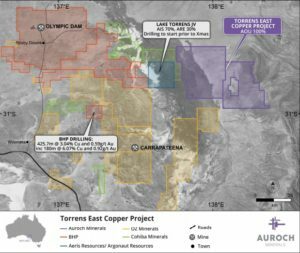 Auroch has pegged 1,622km2 of ground considered highly-prospective for Iron Oxide -Copper – Gold (IOCG) mineralisation in the Lake Torrens region of South Australia. The large exploration licence applications (ELAs) are situated adjacent to the Torrens JV (70% Aeris Resources Ltd; 30% Argonaut Resources NL) and cover the same large gravity anomaly. The ELAs are located approximately 50km from BHP’s recently-announced drilling in the Olympic Dam copper-gold province, host to the world-class Olympic Dam (BHP Group Ltd) and Carrapateena (Oz Minerals Ltd) IOCG deposits. A review of all historical geophysical and geological data is underway with an exploration programme planned for early 2019. 77m @ 2.11% Cu and 0.54g/t Au. BHP is currently evaluating and interpreting these results and intends to commence a follow-up drill programme in early 2019. Listeners are encouraged to submit questions prior to the call by emailing cadence@brrmedia.co.ukor by clicking on the question button at the foot of the webcasting. As at the 12 October 2018 Cadence had the following key investments: 19.7% of the equity in European Metal Holdings, which, through its wholly owned Subsidiary, Geomet s.r.o., controls the mineral exploration licenses awarded by the Czech State over Cinovec; 6.95% of the equity in Bacanora Lithium Plc and 30% of Mexalit and Megalit joint venture companies. Mexalit is the owner of the El Sauz, El Sauz 1, El Sauz 2, Fleur and Fleur 1 mineral concessions, which forms part of the 20-year mine plan of the Sonora Lithium Project in Northern Mexico; 6.6% of Auroch Minerals Ltd; 4.5% of Clancy Exploration Ltd; 12.1% of Macarthur Minerals Ltd; 4% of the San Luis lithium exploration project in Argentina; 30% free carried interest in one mining lease and six exploration license in part of the the Yangibana Rare Earth Mineral deposit and a 100% interest in and exploration license on the eastern boundary of boundaries of Greenland Minerals and Energy Limited’s licences that encompass the world-class Kvanefjeld, Sørenson, Zone 3 and Steenstrupfjeld Rare Earth Element deposits. Cadence invests across the globe, principally in lithium mining projects. Its primary strategy is taking significant economic stakes in upstream exploration and development assets within strategic metals. We identify assets that have strategic cost advantages that are not replicable, with the aim of achieving lower quartile production costs. The combination of this approach and seeking value opportunities allows us to identify projects capable of achievinghigh rates of return. The Cadence board has a blend of mining, commodity investing, fund management and deal structuring knowledge and experience, that is supported by access to keymarketing, political and industry contacts. These resources are leveraged not only in our investment decisions but also in continuing support of our investments, whether it be increasing market awareness of an asset, or advising on product mix or path to production. Cadence Mineral’s goal is to assist management to rapidly develop the project up the value curve and deliver excellent returns on its investments. Cadence Minerals (AIM/NEX: KDNC; OTC: KDNCY) is pleased to note the update published today by Auroch Minerals (ASX:AOU) ‘Auroch’ that it has successfully completed its maiden drilling programme at the Arden Project, in South Australia, with all ten drill-holes encountering horizons of Sedimentary Exhalative (SEDEX) zinc and/or copper mineralisation. Maiden drill programme at Arden intercepts base-metals mineralisation in all 10 drill-holes. Up to 3 horizons of SEDEX zinc mineralisation identified at the Ragless Range Prospect within the Arden Project, extending over 3km of strike and open in every direction. 15m @ 7.52% Zn & 0.02% Pb from 57.65m, including 3.65m @ 15.47% Zn & 0.02% Pb from 62.15m. Additional mineralised bands up to 24% Zn identified in drill-hole RRDD-007 by portable XRF subsequent to initial assay results – laboratory assays are pending. Assays are pending from additional intervals of drill-core sampled subsequent to re-logging of zones surrounding mineralisation at Ragless Range. Auroch’s geology team will continue to use pXRF, surface mapping and surface sampling techniques to build the geological database, with a focus on areas where large interpreted structures meet the projected location of the mineralised SEDEX horizons. 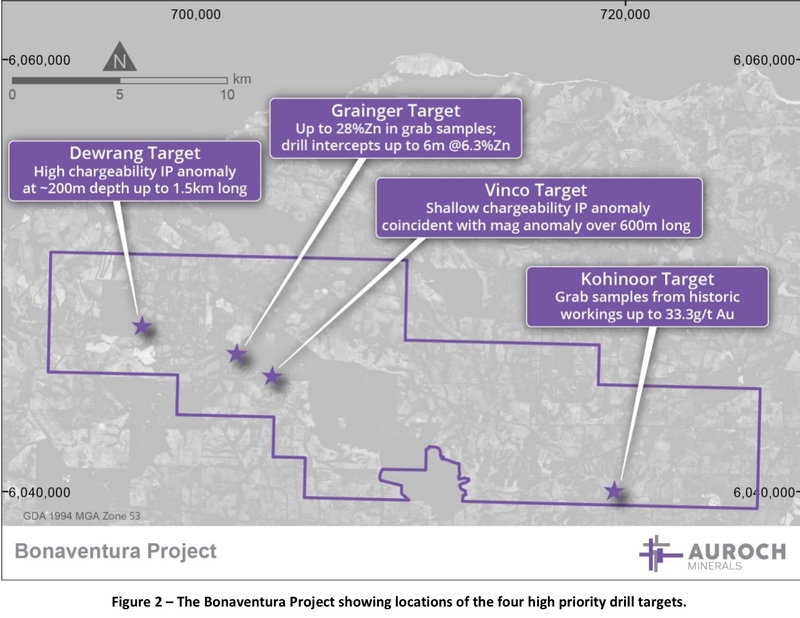 These focussed target areas will be tested with ground geophysical surveys with the intent of defining target areas for the next phase of drilling at the Arden Project in the first half of 2019. Cadence Minerals CEO Kiran Morzaria commented:“This is a positive initial drilling result from Auroch’s Arden project. As CEO Aidan Platel says, the company has exceeded its objectives in the maiden drill programme, not only confirming previously defined SEDEX mineralisation, but (a) identifying concentrated mineralisation that potentially improves the economic grades of the metal inventory and (b) discovering another two SEDEX zinc mineralised horizons that had not previously been identified. Most importantly, this result increases the potential scale of the Arden SEDEX base-metal system, and provides further validation for our investment into Auroch Minerals. Cadence Minerals (AIM/NEX: KDNC; OTC: KDNCY) is pleased to note that Auroch Minerals (ASX: AOU) (“Auroch”) has announced that it has significantly increased its exploration tenure across its Arden and Bonaventura Projects in South Australia. The new areas are considered highly-prospective for base-metals and add momentum to Auroch’s aggressive exploration programmes, with drilling already underway at both Arden and Bonaventura Projects. 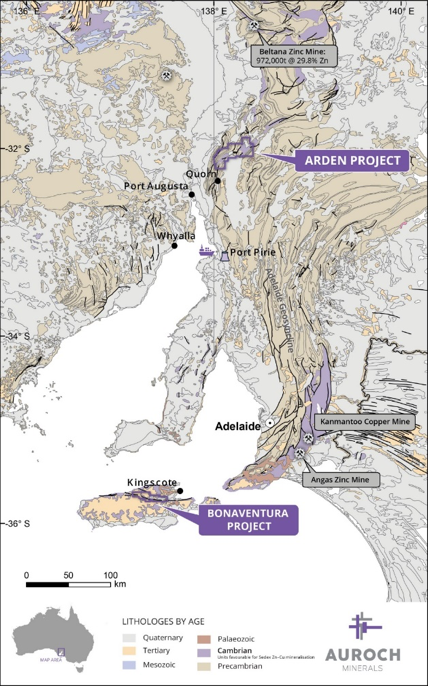 The Arden and Bonaventura Projects now encompass a total of 2,079km2 within the world-class Adelaide Geosyncline, which underpins Auroch’s strategy to consolidate land in the region to systematically and aggressively explore for high-grade base-metal deposits. All three new areas considered highly-prospective for SEDEX and structurally-hosted zinc, copper, gold and cobalt mineralisation. EL Application at the Arden Project has already been granted (EL6217). New licences significantly expand project area by 55%. Drilling continues at Arden and Bonaventura with assay results to be released to marketas they become available. Cadence currently owns approximately 7% of the equity in Auroch Minerals, which is an exploration company targeting principally zinc, cobalt and lithium. Cadence Minerals (KDNC) – Auroch Minerals (ASX: AOU) Accelerates Exploration Programme with Commencement of Drilling at Bonaventura. Cadence Minerals (AIM/NEX: KDNC; OTC: KDNCY) is pleased to note that Auroch Minerals (ASX: AOU) has accelerated its drilling programme with the commencement of drilling at its Bonaventura Base-metals Project in South Australia. With Auroch’s maiden drill programme already initiated at the Arden Project, concurrent drilling is now underway at both projects. DDH1 Drilling Pty Ltd (DDH1 Drilling) is on-site at the Bonaventura Project with a Sandvik DE710 drill rig. 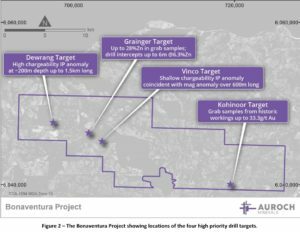 The first drill-hole has been initiated at the Dewrang Target, where Auroch’s recent IP survey identified a robust chargeability anomaly (over 5 times background) that sits between 150 – 200m depth and continues over a strike of at least 1.5km2. The anomaly is located at the convergence of two major faults identified in the high-resolution aeromagnetics, and is also coincident with anomalous zinc and lead in historic surface samples, thus presenting a high priority drill target for the Auroch team. Drilling at Bonaventura Project has commenced with first hole at the Dewrang Targetunderway. Programme to target high-grade zinc, lead and gold mineralisation at Dewrang, Grainger, Vinco and Kohinoor targets. Programme comprising initial diamond drilling campaign of up to 2,500 metres. Drilling programme expected to take approximately 8 weeks to complete. Cadence is dedicated to smart investments for a greener world. The planet needs rechargeable batteries on a global scale – upcoming supersized passenger vehicles, lorries and buses – require lithium and other technology minerals to power their cells. Cadence is helping find these minerals in new places and extracting them in new ways, which will meet the demand of this burgeoning market. With over £20 million vested in key assets globally, Cadence is helping us reach tomorrow, today. Certain statements in this announcement are or may be deemed to be forward-looking statements. Forward-looking statements are identiﬁed by their use of terms and phrases such as ‘‘believe’’ ‘‘could’’ “should” ‘‘envisage’’ ‘‘estimate’’ ‘‘intend’’ ‘‘may’’ ‘‘plan’’ ‘‘will’’ or the negative of those variations or comparable expressions including references to assumptions. These forward-looking statements are not based on historical facts but rather on the Directors’ current expectations and assumptions regarding the Company’s future growth results of operations performance future capital and other expenditures (including the amount. nature and sources of funding thereof) competitive advantages business prospects and opportunities. Such forward-looking statements reﬂect the Directors’ current beliefs and assumptions and are based on information currently available to the Directors. Many factors could cause actual results to differ materially from the results discussed in the forward-looking statements including risks associated with vulnerability to general economic and business conditions competition environmental and other regulatory changes actions by governmental authorities the availability of capital markets reliance on key personnel uninsured and underinsured losses and other factors many of which are beyond the control of the Company. Although any forward-looking statements contained in this announcement are based upon what the Directors believe to be reasonable assumptions. The Company cannot assure investors that actual results will be consistent with such forward-lookingstatements. Cadence Minerals: Auroch Minerals (ASX: AOU) – Drilling Commences at Arden Base Metals Project. Cadence Minerals (AIM/NEX: KDNC; OTC: KDNCY) is pleased to note that Auroch Minerals (ASX: AOU) has commenced drilling at its Arden Base-metals Project in South Australia. The maiden drill programme was initiated at the first planned drill-hole location at the Ragless Range Target, where the initial drill-hole is targeting the depth extensions of a high-grade zinc sedimentary-exhalative. 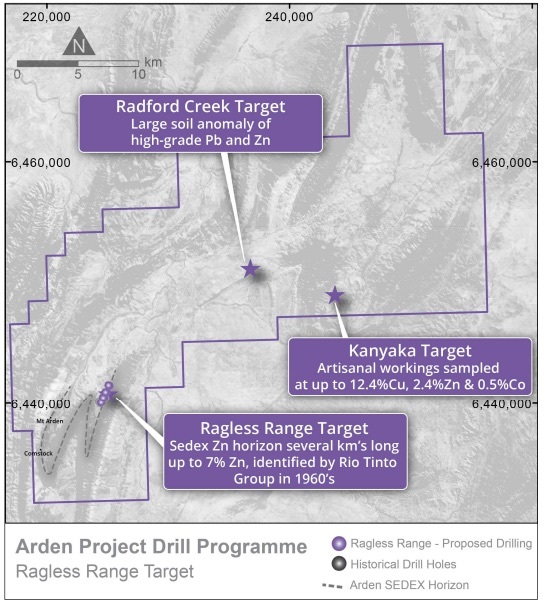 In addition to the Ragless Range Target, the maiden drilling programme at the Arden Project will also test the base-metals potential at the Radford Creek and Kanyaka prospects, where rock-chip samples assaying as high as 12.4% copper, 2.4% zinc and 0.5% cobalt present exciting drill targets.